Follow the Gotham Whale Action Plan to ensure adequate food for whales in the Western NY Bight. 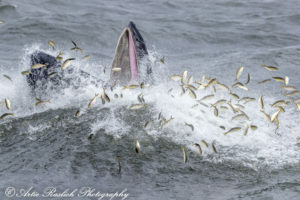 Local fishing competition with whales: The Omega Fleet recently has been fishing just outside the 3-mile limit of NY/NJ. They are fishing legally, but we believe threaten the local population of bunker in the area where whales feed. Gotham Whale policy; While supporting long term regulatory and policy changes in the actions below, we believe that influencing the Omega Company directly could have an immediate and beneficial effect. Our strategy is to direct public attention to the problem and exert pressure in terms of public relations for Omega Protein. We hope the Company will see fit to find other fishing grounds. Our suggestion would be to fish at least 20 miles from the entrance of NY Harbor. Gotham Whale has been documenting humpback feeding in this area since 2011 and we would like it to continue. We are also appealing to the owners of Omega Protein to further persuade them to leave the bunker for the whales. Your Action: Please sign this petition which will be forwarded to both The Atlantic Marine Fisheries Commission and The Company. Atlantic States Marine Fishery Commission: Stronger regulations on the menhaden fishery. Gotham Whale Policy: We support lowering or at least maintaining the Cap on the Total Allowable Catch. It is currently set at 216,000 metric tons. 80% of which is taken by the purse seine reduction fishery conducted solely by Omega Protein. We also support a change in fisheries management policy to that of ecological management rather than as a single species.Current management doesn’t take into account whether menhaden are being caught from the same area where whales feed. In fact, current management doesn’t take into account any of menhaden’s many important predators. Ecological management would take into consideration the local effect on the whales. Your Action: Stand by to support our efforts at the next ASMFC meetings. Click on the button below for information on the Commission. NY State Legislation - We did it! Gotham Whale Policy: The NY Senate has voted to prioritize protecting our environment by banning offshore drilling and protecting the menhaden fish that the whales around NYC depend on. THANK YOU FOR YOUR SUPPORT! Currently NY State requires a permit for menhaden fishing within the 3-mile State boundary. The permit is $1000 which is no deterrent to Omega. The permit could require an observer on board and for timely reporting of the catch. Omega chooses to forgo a permit and fish just outside the State jurisdiction. The State Boundary does not protect the menhaden in our area. Gotham Whale supports the total ban of the reduction fishery within State waters. We are not opposed to the bait local fishery because their impact is low. Your Action: Tell NYS Governor Cuomo you support the bill. Support the Effort: Gotham Whale is an all-volunteer group up against a well-funded mega corporation. Your financial support is appreciated and will help us achieve our mission. Become a Gotham Whale Member. See our membership plans – benefits include free whale watches on American Princess Cruises. Purchase Gotham Whale Gear and look great! Our items make wonderful gifts and every purchase supports our efforts. Donate! Unrestricted funds are great and help offset operating costs so we can continue the good fight.